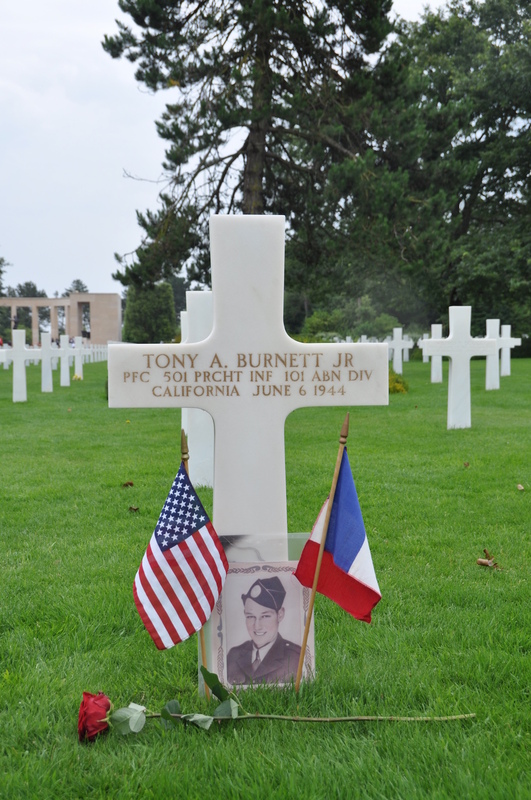 Private First Class Tony A. Burnett, Jr.
Tony attended Emerson Elementary School and Woodrow Wilson Junior High School. Then he attended Pasadena Junior College, a local high school merged inside a community college. After three years, he dropped out of school to support his family, which now included Emma’s husband, Donald, and newborn daughter, Emilie. He worked a variety of jobs, ranging from a pin setter in a bowling alley and to a barbershop. He enlisted in the U.S. Army just two days before his 19th birthday. In February 1942, citizens reported flares and blinking lights in the sky near the defense plants and the anti-aircraft batteries in the hills just outside Los Angeles. Convinced that the Japanese were coming to attack, the 37th Coast Artillery Brigade fired 1,440 rounds of ammunition. When daylight came, there was no evidence of the attack. The only real damage resulted from traffic accidents caused by people who drove without headlights. Scientists later concluded that the so-called flares and blinking lights were from weather balloons being sent up from Westwood and Santa Monica. Although there never was an attack from the Japanese on the west coast of the continental United States, fear and paranoia remained constant throughout the war. Caltech and the Jet Propulsion Laboratory (JPL) were both located in Pasadena. They developed weaponry for the United States. Starting in August 1941, they designed jets with assisted take-off (JATOs) that could lift off in half the normal distance. In 1944, they developed guided missiles which could steer themselves towards a chosen target, as well as the WAC Corporal, a new rocket. Pasadena, California is best known for hosting the Rose Parade to mark the start of every year. 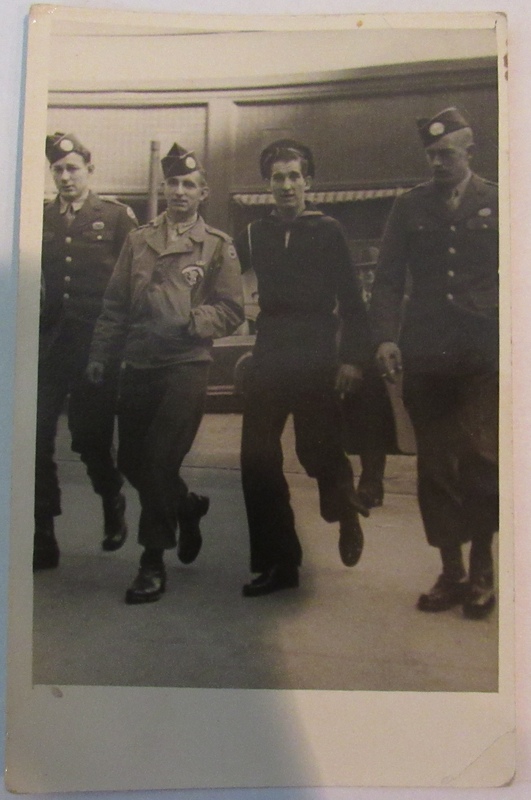 However, the parade was scaled back during World War II due to the huge quantity of materiel needed. The Rose Bowl game was also moved across the country in 1942 because Americans feared that another attack from the Japanese was coming so soon after the attack on Pearl Harbor. Private First Class Burnett enlisted in the U.S. Army on August 14, 1942, and was assigned to the 101st Airborne Division, the Screaming Eagles. He completed his initial training at Camp Toccoa in Georgia. Burnett volunteered as a paratrooper in D Company of the 506th Parachute Infantry Regiment (PIR). Camp Toccoa was located near the Currahee Mountains and the regiment adopted the word “currahee,” meaning “stand alone” in Cherokee, as their motto. The word represented the independence that each paratrooper needed in preparation for combat, where they would often find themselves alone. The dangerous job of a paratrooper attracted some of the bravest men. Lieutenant Colonel Robert F. Sink, the regimental commander of the 506th Parachute Infantry Regiment, established a unique training style that both pushed individual soldiers and set a world record for marching stamina. Private First Class Burnett was part of the historic group of about 600 paratroopers who marched 115 miles to Atlanta in just three days when his regiment was relocated. Burnett continued his training at Fort Benning in Georgia and received his certificate of completion for parachute packing, ground training, and jumping, on December 26, 1942. In a letter to his parents, Burnett’s zeal for his job as a paratrooper was evident; he wrote that he would jump every day if he could. 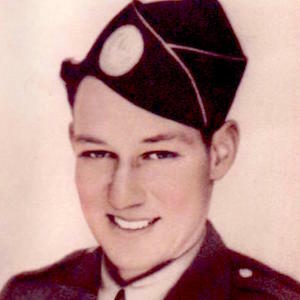 After a brief stay in a hospital in Fort Bragg, North Carolina, Private First Class Burnett transferred to the 501st Parachute Infantry Regiment, 3rd Battalion, G Company They continued training at Fort Benning and at Camp MacKall in North Carolina until the regiment deployed to England in January 1944. The regiment trained in England and participated in some rehearsals to ensure that each soldier was prepared for the difficult task that lay ahead: the invasion of Normandy. On the day of the invasion, the 3rd Battalion of the 501st Parachute Infantry Regiment left in five waves of planes from Welford Airfield. Private First Class Burnett was aboard a C-47, plane 43-30734, which was part of the third flight of the second wave. In addition to the pilot, co-pilot, navigator, aerial engineer, and radio operator, there were 17 paratroopers aboard. At 1:19 a.m., the plane was first struck by enemy anti-aircraft fire in the radio compartment, causing the aircraft to burst into flames. Immediately following the first hit, the jumpmaster, Staff Sergeant Charles F. Word, yelled to the rest of the paratroopers, and urged them to jump quickly. Before they all had the chance, the plane was hit a second time near the tail. The aircraft crashed and exploded in an apple orchard near the small village of Picauville. Only three of the 22 men aboard the C-47 were able to jump out before the crash: Staff Sergeant Word, Private Arthur E. Morin, and Private First Class Lucien A. Tetrault. Private First Class Burnett and his fellow soldiers had made the ultimate sacrifice hours before the seaborne invasion began. In just twenty years, Private First Class Tony Allen Burnett, Jr. held all of these roles. As a brother, he horsed around with his four sisters in New Orleans, Louisiana, and in Pasadena, California. He surely had many adventures with his sisters, Adell, Bertie, Emma, and Florence, including one literal wild ride on a sheep perfectly captured in a photograph that showcased the youthful joy that characterized the early years of his life. However, his family experienced hardship like most did throughout the Great Depression. His family relocated to sunny southern California in 1928 after losing a hotel business in New Orleans, with his father working any job he could find. As a son, he left secondary school after three years in order to support his family, which now included his newborn niece, Emilie La Febvere. In a few short years, he worked multiple jobs as a pin setter in a bowling alley and in a barbershop. 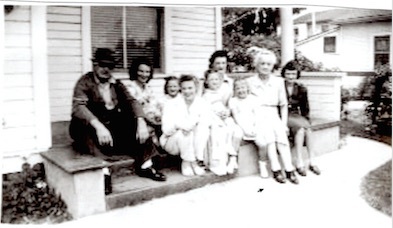 He understood the value of hard work and loyalty to his family as he sacrificed the last few years of his education to help push his family of seven through the Depression. On August 14, 1942, two days before turning 19, Private Burnett enlisted in the United States Army and dedicated the last chapter in his life to securing the freedom of our nation and the rest of the world. The values that Private Burnett learned in his hometown of Pasadena would serve him on each adventure that his military career took him on, from Fort Benning all the way to France. He trained tirelessly after volunteering for one of the most risky jobs in the military: a paratrooper. On the day of the invasion, Private Burnett prepared to leave from Welford Airfield, and packed his belongings, including an American flag he placed in his pocket. He was part of the second of five waves being sent across the English Channel, so defenses were aware of the invasion and prepared to defend their land. He was part of the 101st Airborne Division, 3rd Battalion of the 501st Parachute Infantry Regiment, G Company. His plane was hit by enemy anti-aircraft fire before he made his first jump, and only three men were able to escape before the C-47 crashed near an apple orchard in the small village of Picauville. Private Burnett had made the ultimate sacrifice for his world. In twenty short years, Private Burnett affected the lives of countless individuals. But the war cut his life short and he lost the opportunity to own a house, to find love, to have a child. In ensuring the safety of his loved ones, our nation, and the world, Private Burnett did not get to experience all the milestones that we anticipate. His bravery during the war continues to inspire me and will not be forgotten by my generation. In uncovering details about Private Burnett’s life, I was impressed by the remarkable impact he had on his community. He was loved, just like every one of these Silent Heroes. His niece Emilie told me that the entire family compared her son Christopher, Private Burnett’s great-nephew, to him. She often told him, “you’re just like my Uncle Tony was: so perfect in every way.” This perfection, from his easy smile to his kind personality, has not been forgotten by those who he affected. Mrs. Richonne and I are now two of those people, and from now on we will celebrate his extraordinary twenty years and remember his selflessness for the world we share. Thank you, Private Burnett. The opportunity to learn and grow through the Normandy: Sacrifice for Freedom® Albert H. Small Student and Teacher Institute has been unforgettable. For six months, I was able to study history with a group of scholars who were equally as passionate about learning and committed to their individual research. It was refreshing to be in an environment where a group of students pushed each other in research and challenged one another in discussions. When we traveled to France, the experience was further heightened. It is hard to describe the wave of emotions that washed over me as the tide rolled in on Omaha Beach. I grabbed my friend’s arm as we cautiously made our way over the rocks and up the cliff. As we tried to keep from falling, we remembered that 73 years before us, the men who came ashore saw a very different landscape. They faced obstacles and heavy fire from the Germans as they charged the same cliff. It was eerie and heartwarming to see the beach so peaceful because we had come to know it as a place where our brave soldiers faced chaos. The Airborne Museum in Sainte-Mère-Église was a meaningful site because I was able to see a C-47 in person, the type of plane my Silent Hero boarded on D-Day. I noted the thin walls that made a hollow sound when tapped on, and I imagined how destructive a single hit would be to the entire crew. The experience gave me a newfound appreciation for the bravery that my Silent Hero had. The moment I entered Normandy American Cemetery, it felt as if something had changed within the whole group. We had an incredible experience over the past two weeks and became a tight-knit group, chattering on bus rides and over dinner. However, when we stepped into the cemetery, there was a different energy: we were ready to share our Silent Heroes’ stories with the world. I listened intently as my peers told their stories, and I walked out feeling fulfilled not because I had done my job, but because I knew I would continue to do so as I shared Private First Class Burnett’s story with the world. This experience has been one that I will not forget, and I cannot thank everyone involved enough for opening my eyes to a new way of looking at history and the world. 101st Airborne Division; World War II Operations Reports, 1941-1948, Records of the Adjutant General’s Office, 1917-, Record Group 407 (Box 11752); National Archives at College Park, College Park, MD. 101st Airborne Division; World War II Operations Reports, 1941-1948, Records of the Adjutant General’s Office, 1917-, Record Group 407 (Box 11773); National Archives at College Park, College Park, MD. Burnett family photographs. 1924-1944. Courtesy of Emilie Kendrick. Ball, Lamar Q. “600 Singing Paratroopers Do 115-Mile March in Three Days.” The Constitution, December 4, 1942. http://www.northgeorgiaairborne.com/history/600-singing-paratroopers-115... ch-three-days/. California. Orange County. 1940 U.S. Census. Digital Images. http://www.ancestry.com. Churchill, Winston S. The Second World War, Volume 6: Triumph and Tragedy. Boston: Houghton Mifflin Company, 1953. Kendrick, Emilie. In person interview with Sonia Kelly and Judy Richonne. March 25, 2017. Louisiana. Natchitoches Parish. 1920 U.S. Census. Digital Images. http://www.familysearch.org. Missing Air Crew Report; Office of the Quartermaster General, Memorial Division, Identification Branch, 1942-1947, MACR 8414; National Archives at College Park, College Park, MD. Pasadena Post. “Paratrooper, Navigator Die in Action.” July 30, 1944. Pasadena Star-News. “Pasadenans Serve Nation at War.” January 23, 1943. 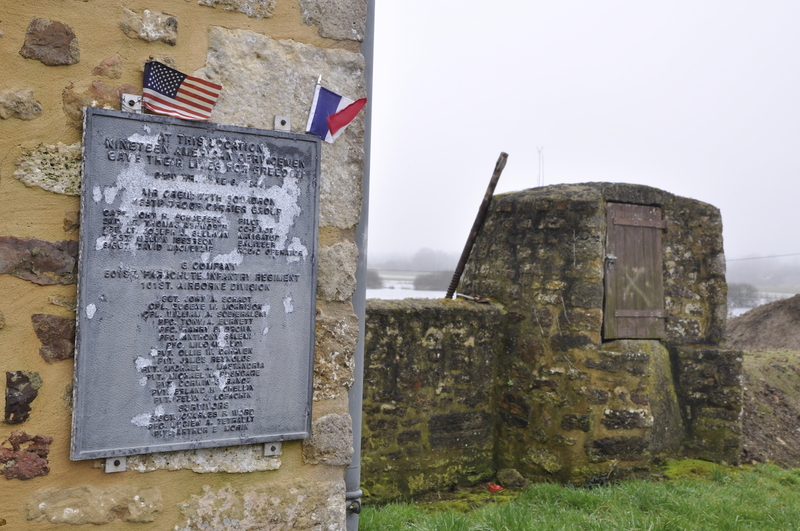 Photograph, Memorial Plaque in Picauville, France. March 3, 2017. Photograph, Apple Orchard in Picauville, France. March 3, 2017. Records for Tony A. Burnett, Jr.; World War II Army Enlistment Records, 1938-1946 [Electronic File], Record Group 64; National Archives at College Park, College Park, MD [retrieved from the Access to Archival Databases at http://aad.archives.gov/aad/fielded-search.jsp?dt=466, April 17, 2017]. Tony A. Burnett, Jr., Individual Deceased Personnel File, Department of the Army. Tony A. Burnett, Jr., Official Military Personnel File, Department of the Army, RG 319, National Archives and Records Administration - St. Louis. Ambrose, Stephen E. Band of Brothers: E Company, 506th Regiment, 101st Airborne from Normandy to Hitler’s Eagle’s Nest. New York: Simon & Schuster Paperbacks, 1992.
modified 2016. Accessed March 4, 2017. http://www.militarymuseum.org/BattleofLA.html . Conway, Erik. “JPL History.” Jet Propulsion Laboratory, California Institute of technology. Accessed April 9, 2017. https://www.jpl.nasa.gov/jplhistory/early/wartime.php. Koskimaki, George E. D-Day With the Screaming Eagles. Presidio Press, 1970. “Pasadena Endures the Depression and War: 1930-1950.” The City of Pasadena. Last modified 2017. Accessed March 5, 2017. http://www.cityofpasadena.net/history_1930-1950.aspx. “The 506th Parachute Infantry Regiment.” World War II Airborne. Accessed July 1, 2017. http://www.ww2-airborne.us/units/506/506.html. “The 501st Parachute Infantry Regiment.” World War II Airborne. Accessed March 26, 2017. http://www.ww2-airborne.us/units/501/501.html. “Tony A. Burnett Jr.” American Battle Monuments Commission. Accessed January 25, 2017. https://abmc.gov/node/407386#.WWUfEtPyveQ. Wieviorka, Olivier. Normandy. Translated by M. B. DeBevoise. Cambridge: The Belknap Press of Harvard University Press, 2007.